Make this sweet crunchy candy on the cooktop or microwave. Peanut Brittle is made with sugar, corn syrup, salt, and dry roasted peanuts until the mixture reaches 310 degrees or hard crack stage, then baking soda, butter and vanilla is added. The hot mixture expands, changes color and poured onto a greased baking sheet. Allow the brittle to stand 5 minutes then break into pieces. This candy is quick to make and works best if you know what wattage your microwave is set. If you don’t know, do the cook top method but use a candy thermometer. You will love this recipe! Microwave Method: Spray baking sheet with cooking spray, set aside. Measure baking soda and place in small cup, add cubed butter and have vanilla ready. Lightly spray large glass mixing bowl and add first three ingredients, stir to combine. Microwave on high for 3 minutes, add peanuts and microwave 2 minutes more. Color of brittle should be a light amber. Stir in remaining ingredients. Mixture will expand when adding baking soda and butter/vanilla. Immediately spread mixture in greased baking sheet rotating sheet to smooth and spread mixture. Allow to harden 5 minutes. Break into pieces. Cooktop Method: Lightly spray medium saucepan with cooking spray, cook first 3 ingredients over medium heat, stirring constantly until mixture starts to boil. Boil without stirring for 5 minutes until a candy thermometer reaches 310 degrees. Add peanuts and cook 2 minutes more or to 280 degrees. Mixture will be amber in color. Do not allow the mixture to burn. Remove from heat and add butter, baking soda and vanilla, stir to combine. Mixture will expand and change color. Pour mixture into greased baking sheet. Rotate baking pan to spread hot mixture to even layer. Allow to stand 5 minutes or until hardened. Break into pieces. 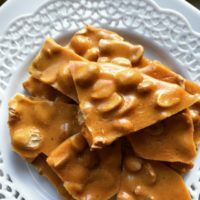 You will need a candy thermometer if making the cook top brittle. If you make the microwave method, watch your time and mixture. First setting on microwave should be 1,000 watts, then next setting use a 700 watt microwave. Watch the mixture you should be able to tell if the mixture is a medium amber in color that is a good indication the microwave brittle is at the hard crack stage. Feel free to add 1/4 teaspoon diced chipotle in adobe sauce to add heat to your brittle. Chocolate Peanut Brittle-Dip peanut brittle pieces into melted chocolate.